Be the first to share your favorite memory, photo or story of Herminia. This memorial page is dedicated for family, friends and future generations to celebrate the life of their loved one. Our beloved mother, grandmother to everyone, as well as friend returned to her heavenly home on Thursday, November 8, 2018. Her devotion to her family and firm belief in God supported her in her struggles and ultimately gave her peace at the age of 94. Herminia “Abuela” was born on January 13, 1924 in Puerto Rico, daughter of the late Francisco Perez and Lucia Carrillo and wife to the late Juan Fuentes. 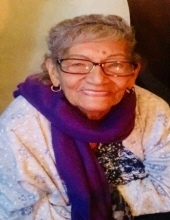 Herminia was blessed with a large and loving family and is survived by her sisters Carmen Amelia Colon, Rosa Perez, Antonio Lebron Carrillo, and Francisco Perez. Herminia had nine children with four of her children still living, Robert Fuentes and his wife Debbie, Brunilda Fuentes, Miriam Ortiz, Orlando Ortiz and Frankie Fuentes and his wife Delia and 70 grandchildren, great grandchildren, and great-great grandchildren. Herminia was loved by all and everyone considered her their “abuela”. She loved being with her family and all her grandchildren at many family gatherings, trips to Florida, and going to Memphis, TN to visit Graceland. She was an amazing cook and enjoyed sewing as well as traveling to see many sights. Visiting will be held from 3 to 7p.m. on Wednesday, November 14th at Doulin Newburgh Funeral Home, 318 North Montgomery Street, Newburgh. To send flowers or a remembrance gift to the family of Herminia Fuentes, please visit our Tribute Store. "Email Address" would like to share the life celebration of Herminia Fuentes. Click on the "link" to go to share a favorite memory or leave a condolence message for the family.